The Hinged Plategrip fastener is ideally suited for applications where the loading and delivery points frequently change, such as mine, pit, quarry, and construction sites. As a compression-type fastener, secured by bolts, it provides tremendous holding power with good troughing action, while being readily separable after installation. The hinged steel fastener can be used on all conveyor belts from 1/4″ to 5/8″ thick, and allows the joining of belts of varying thicknesses. First, determine the size specifications. Then, click on the Product Line tab above to view the complete Hinged Plategrip product line. Hinged Steel is the most common and economical belt fastener material, and the standard for most applications. 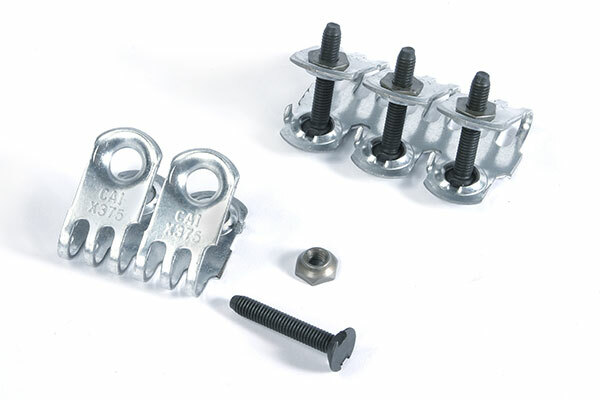 Steel Fasteners are plated to resist moisture and are available in matched sets ordered by width of belt or as X550-1, X550-3, X375-2, or X375-3, in bulk packs. Hinged Stainless Steel fasteners – nickel and chrome alloy – are best for applications in which erosion is a major problem. Stainless steel is more resistant to abrasions, acids, chemicals, and magnetic attraction than standard steel. 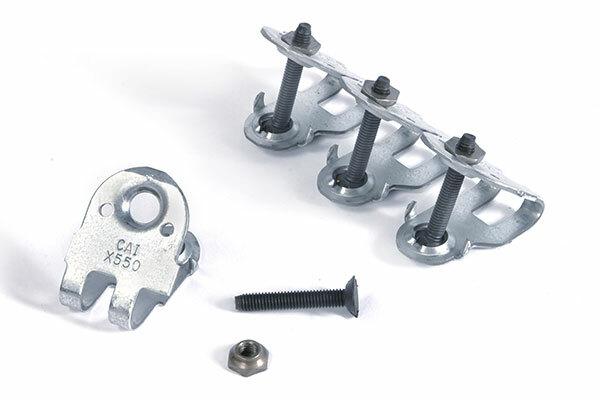 Plategrip fasteners are available in complete stainless sets. Hinged Durgard is a special heat-treated steel with abrasion-resistant characteristics that provide several times the life of standard steel. Hinged Durgard fasteners are not recommended for use in highly corrosive environments, but are instead specially formulated for abrasive situations. © Conveyor Accessories, Inc. - All rights reserved.